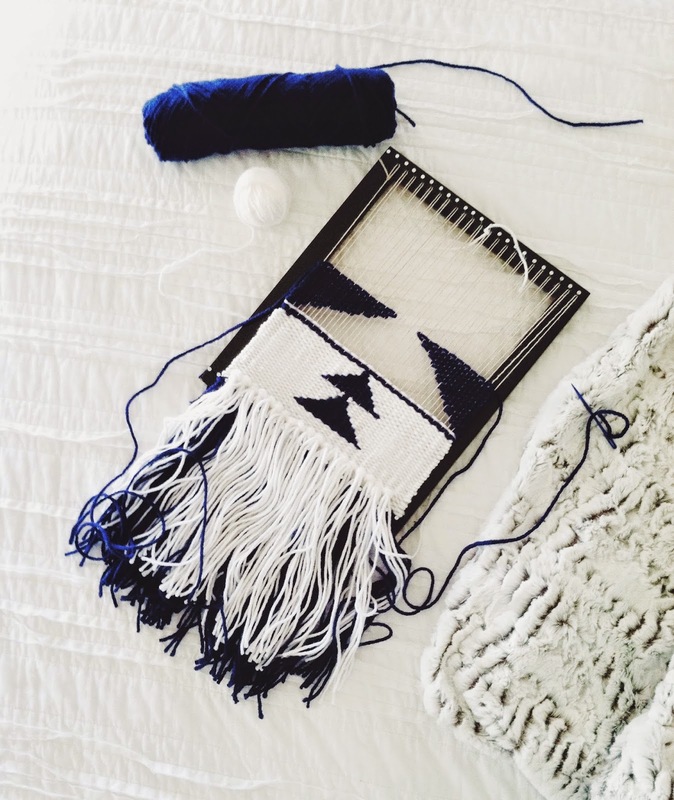 Making ... woven wall hangings. It started because I have an abundance of yarn and the walls are so bare. It's turned into my new favorite craft. Cooking ... burritos. Tonight. If I write it down it will happen, right? Because honestly, there hasn't been a lot of cooking around these parts recently. Reading ... The Black Dahlia, by James Ellroy. I've never seen any of the movies his novels have been made into and really wanted to start the LA Quartet. It's seedy and Noir-ish and perfect for this time of year. Wanting ... to turn on the heat, but James deems it far too early. Looking ... at the last of the pretty leaves this autumn graced us with. Playing ... 90s pop music. It's the only thing that motivates me to clean the dishes these days. Wasting ... away brain cells watching Pretty Little Liars on Netflix. I was so meh through the first season and now I think I kind of care? Sewing ... a button back onto my shirt. Wishing ... we had more storage in this place. Enjoying ... blogging again. It's nice to have a creative outlet. Waiting ... until the downstairs neighbor leaves to vacuum. It's kind of ridiculous how loud our vacuum cleaner is and I just feel too bad about it to do it when he's around. Liking ... piles of blankets and both of us reading before bed. Wondering ... where my crockpot is. Loving ... James's kitchen escapades. We've only had to take the battery out of the smoke detector twice in two meals. Hoping ... the forecast for snow on Sunday is so incredibly wrong. Marveling ... at the amount of laundry we always seem to have. Needing ... to organize the bedroom. I swear it was clean not two weeks ago! Smelling ... nothing. My cold weather sinuses would never allow that. Wearing ... my decadent slippers from LL Bean that have transformed my life. Following ... the sidewalks around here. Still getting the lay of the land. Noticing ... I need to go grocery shopping. Thinking ... about what this place needs to feel more homey. Bookmarking ... an actual book page instead of webpages. Opening ... boxes. Thank you Amazon prime for being a thing. Giggling ... at James's layering ability during this 'in between, too early to turn on the heat' time. We're talking thermals, giant sweatshirts, sweatpants tucked into thick socks. This is why, if it were up to him, the heat would never have to come on. Idea taken from here, originally created here.